I know the school year is almost over (WOO HOO! ), but it's not too late to post another teaching tid-bit, is it? I found this idea on Pinterest. It was the perfect activity to do on a half-day, which we have once a month. To start the lesson, we talked about all of the books I've read to them this year, and discussed our favorites. Every year, I start off with my all time favorite, The Miraculous Journey of Edward Tulane by Kate DiCamillo. Have you read this book? If not, add it to your list. Even if you don't have students or kids to read it to. It's such a sweet book! I read it every year, and cry every year. Okay, I'm rambling...I'll have to save my favorite books for another post. After we discussed our favorite class books, I had the students think of all the books they've read this year. They picked their favorite and were given a piece of cardstock which I folded to look like a book with a binding. They illustrated the cover, and wrote a brief summary on the back. We read some summaries on the back of some of the books in our class library and the students noticed that many of them ended in questions. We discussed how the questions left you wanting to read more to find out what happens in the book. Here is one of the book covers up close. 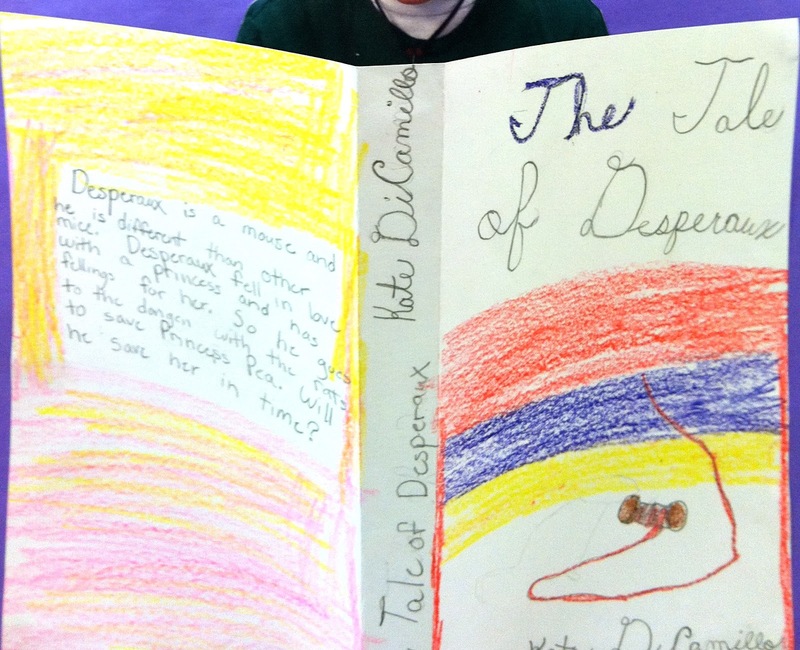 Aaah, The Tale of Despereaux. Another favorite! As they were working on their book covers, I called them over one at a time to take their picture. And that's all folks. An easy, fun activity to do with your kiddos. Here is the finished hall display. I love this! I'm definitely going to copy you on this one. How big are the photos? Did you print each one on 8.5 x 11 paper? This is such a great idea and very easy to do. You are a genius! I was also wondering the approximate size of the photos. Thank you. thank you for a brilliant idea. tnx for sharing.